We respond to many common questions our customers have and provide information that may be of use to you when considering investing in a solar array or getting the most out of your existing solar array. Your SolarEdge inverter and the SolarEdge monitoring portal dashboard provide you with information regarding your energy production. These do not show you the energy you are exporting to your electrical utility, nor detail your consumption. Some utilities will provide you the amount of energy you imported from and exported to the grid during the billing period. Other utilities only provide the net amount you imported from their grid or zero, if you exported more than you imported. If you are like some of our solar customers, you’d like to have your own source of this information to compare to your bill. Below is a review of the first of three solutions for you to consider. NOTE: As always, it is best to read multiple independent reviews before deciding on one of these products. your self-consumption, the amount of energy you consumed that your array produced. there is the ability to add or remove information from the graphs for clarity. The diagram below shows a view of a full month of production at a glance including Consumption (in red), Solar Production (in green) and Self-consumption (in blue). The graph below shows energy imported (from the grid) and exported (to the grid). If you want to look at a single day at a time, you can see more detail. There are numerous options for displaying this data, even adding and removing categories of data. 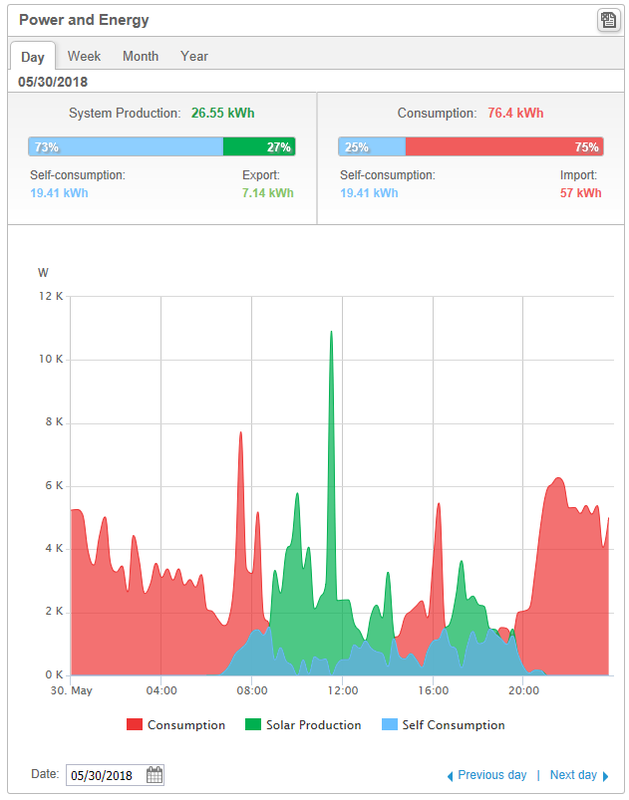 The information at the top of this image show that, of all the energy produced, 73% was self-consumption and 27% was exported to the grid. Of total consumption, 25% was produced by the array and 75% was imported from the grid. The graph below shows information in 15-minute intervals. For the data shown here, it was a rainy day, so production was rather spotty. At times production was greater than consumption (green area higher than the red and blue). Early and late in the day, consumption rose well above production. installation and configuration really should be performed by an electrician or solar professional. Feel free to contact us using the link at the top right above.